Welcome To Drilltech Engineers Pvt. Ltd.
(Drilltech Engineers Pvt. Ltd) was established in 1990. In a short span of 23 years, Drilltech Engineers Pvt. 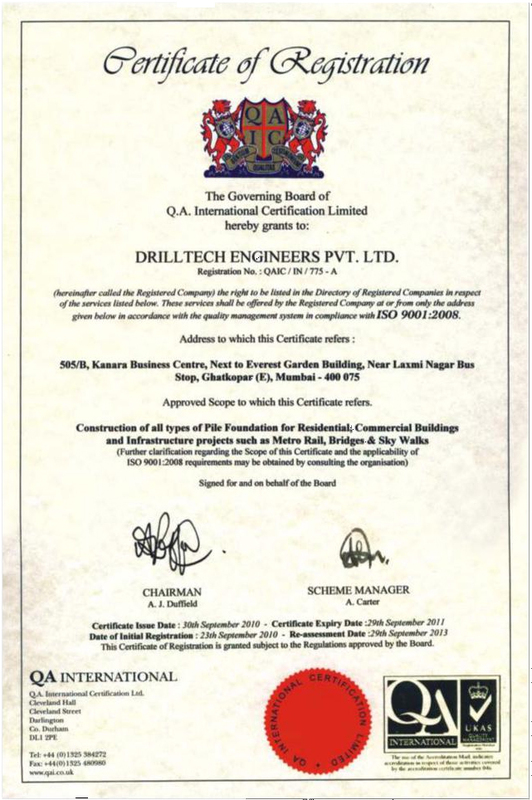 Ltd. today, is a leading company of Piling foundation, Engineering and Infrastructure Development with primary focus on Development of Commercial and Residential buildings, Towers, Metro Rail, Bridges, by using Hydraulic, Rotary Rigs like HR 130, HR 180 and continues to strive for Excellence. Drilltech Engineers Pvt. Ltd., lead by Mr. Salauddin Shaikh maintains the reputation of being the best in the industry, and strives to build upon its competitive strengths and business opportunities to become a leading construction and infrastructure company in India. Drilltech Engineers Pvt. Ltd. has been most active in Mumbai, and all major cities in Western, Southern & Central India. It also undertakes Geo-Technical investigation works, Rock Anchors, Micro Piles by using Calyx Machinery and DTH Machinery. Registered Address 505-B, KANARA BUSINESS CENTER,NEAR LAXMI NAGAR BUS STOP, GHATKOPAR(E),MUMBAI-400 075. Our team members are completely devoted towards the company and are engaged in different operation very efficiently. They own years of industrial experience that lead the business in a smooth and systematic manner. They are experienced professionals and highly skilled to offer admirable services in the market. Because of our team members, we have built a long lasting relationship with our each customer’s and maintain it with their great efforts. Our organization deeply understands the value of clients and in order of that, we are engaged in offering superior quality services in the industry at feasible price range. We welcome our clients with their own specification and accordingly execute our services. Capitalizing on our every-upgrading technologies, domain expertise and strict quality control, we are able to provide best services that best suit client specific requirements.